What can parents do to prevent or limit seasonal allergies? | Checkup | Kids VT - small people, big ideas! What can parents do to prevent or limit seasonal allergies? About 50 million Americans experience seasonal allergies. If you're one of them, it's more likely that your child will be, too. In spring and summer, the major irritants are grass and pollen, but dust, mold and pet dander can make your li'l snifflers miserable any time of the year. This month, Lewis First, chief of pediatrics at Vermont Children's Hospital at Fletcher Allen Health Care, offers advice for dialing down the drippy nose and watery eyes. KIDS VT: At what age do seasonal allergies first appear? LEWIS FIRST: If you're going to have a seasonal allergy, it usually begins in toddlerhood. And if you don't have it by the age of 10, you're probably not going to have horrendous problems with seasonal allergies. KVT: How do parents differentiate between allergies and colds? LF: Initially, most parents will think an allergy is a cold. But oftentimes, if the eyes and nose are itching, if the kids develop a rash — and most importantly, it's not just the nose that's congested, but the eyes are watering with a clear discharge, with a lot more sniffling and itching — that would point to an allergy. 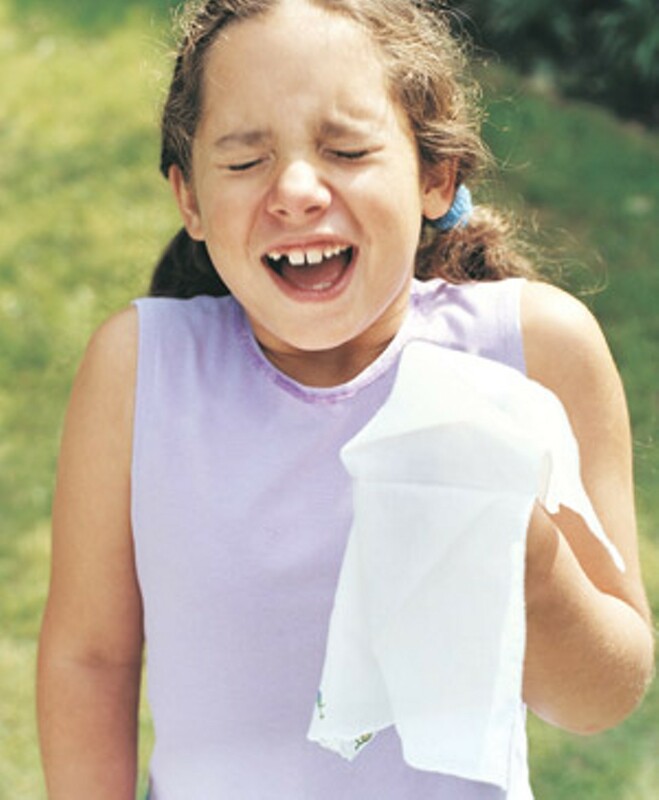 KVT: Can parents prevent the onset of seasonal allergies or reduce their severity? LF: Once you have a seasonal allergy, you're likely to have it at least throughout your childhood into adulthood, when it tends to get a little better. The secret is not in the treatment but in preventing the symptoms from occurring. Some simple things: Grass and pollen tend to be at their worst in late morning and early afternoon. So, if your children go to the playground then, they're going to have a bigger dose of pollen than if they go later in the afternoon. When your children come in from playing outside, if they're prone to allergies, take their clothes off as soon as they're in the house and have them wash themselves, so they're not keeping pollen on their bodies and are not exposed to it while they sleep. LF: Having an air filter or air-conditioning system or keeping the windows closed in the spring will reduce the pollen counts in the house and, hopefully, reduce the severity of the allergy. In addition, if kids have allergies and are exposed to secondhand tobacco smoke, it's harder to clear the smoke from their bodies. It's a good idea to wash pets down if they've been outside, because they can bring allergens into the house, too. KVT: Is it true that children who grow up on farms or with pets tend to have fewer allergies? LF: There are some studies that suggest you don't want your child to grow up in a bubble in the early years, because, if they do, your child's body will recognize things in the environment more as an enemy than a friend. If you expose your child during the first several months of life to the outdoors or to a pet — early on, when the immune system is learning about itself — there are studies that show they're less likely to have an allergic reaction. In fact, some studies say that if you have a pet when younger, or roll in the grass, you're less likely to have allergies. But a variety of studies point in both directions. A little exposure may be a good thing. If there's a strong family history of grass and pollen allergies, they're probably going to be there, even with a little early exposure. KVT: Any recommendations for the home? LF: The best thing you can do is keep your home wiped down so that surfaces don't collect pollen, grass or mold. Try to keep the pets out of the bedroom, keep clothes from the outdoors out of the bedroom, change in another part of the house so that you're not constantly being exposed to it while you sleep. Also, keep the windows closed, if at all possible, during grass and pollen season. KVT: And if those don't work? LF: There are some medications your child's doctor can recommend. We do not recommend decongestants, such as pseudoephedrine, anymore for children under 2, and I don't like them for children under 6, because they do come with side effects that can range from irritability to sedation to hallucinations to abnormal heart rhythms. They can also cause drowsiness. And about 10 percent of people have a paradoxical response, such as hyperactivity. Do the environmental preventions first. KVT: How about children's bedding? LF: A good idea is to wash all bedding and stuffed animals in hot water every seven to 14 days. If it gets really bad, there are plastic covers that can be put over mattresses, pillows and box springs. You may want to get heavy draperies, which can collect pollen and dust, out of a child's room. And if mold is a culprit, make sure your basement isn't damp or water damaged. I would avoid the use of ceiling fans, which can spray the pollen all over the room and move the allergic trigger right back to your child. In allergy season, if your child is having substantial symptoms and you want to know exactly what the culprit is, speak to your child's doctor, who may want to do blood or skin testing, or have it done by a pediatric allergist. Ken Picard is a staff writer at Seven Days. He lives with his wife and daughter in Colchester.